June. Google’s share slipped to 77.5% from 78.5%. Microsoft’s new “decision engine” posted the strongest gains in the travel and financial services categories. room for Microsoft to eat away at Google’s search dominance. It’s a handy little tool, and if it gets users to switch over to Bing Travel from other sites, it will be very lucrative for Microsoft. As the default tab for Bing, Bing Travel got a 90% boost to traffic versus May, 2009 simply by being subsumed into Bing. The only problem is, Bing Travel doesn’t just use Farecast technology. It also borrowed a look and feel startlingly close to that of comparion engine Kayak.com. So much so that Kayak is accusing Bing of copying its site. According to Wired, Kayak has issued a legal notice and the two companies are discussing the matter currently. criticism of Google, whose dominance over the market has made its brand name synonymous with search. But in order for Bing to really compete, Microsoft has to prove that it can deliver better results than Google. Over the broad swatch of the Internet, that is a difficult task. However, if Bing can hone in on small areas and improve the ulitilty of search results for specific searching categories, it can begin to eat away at Google’s marketshare. The company just has to be careful about borrowing too much from existing technology in the process. The results of Kayak’s claims are not in yet, but it doesn’t help that semantic search engine Hakia also claims that Bing’s search categorization bears a striking resemblance to its technology. Especially considering that Hakia was in early talks to partner with Microsoft on its new search engine. During a recession, many companies are forced to make very difficult decisions. This has been especially true in the current recession, which has been not only been deep, but global. 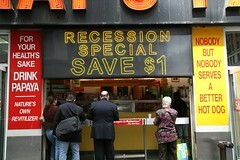 Most recession decision-making is pragmatic. The future is not guaranteed and depending on your company’s financial situation, short-term survival often trumps long-term strategy. But while surviving may be your priority, decisions made during a recession can have a significant impact on the future of your business well beyond the recession.